So black it's hard to take pictures! 2016 daughter - Velvet Revolver!! 2015 son - Steely Dan 1st at Futurity! 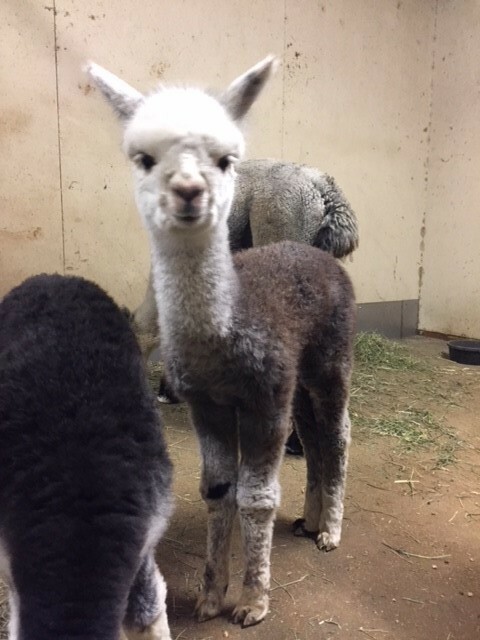 This is the alpaca we've been waiting for. Born at Lassen View, we were excited from the day he hit the ground. A beautiful medium silver grey male with spectacular fleece length and crimp. Vantaggio has begun his breeding career after a spectacular show career. If you'd like to add Bisturi's genetics to your line up, schedule your breeding today! News Flash! 21 cria on the ground....with beauty & density! Bella Mia is a conformationally correct female sired by Snowmass Legacy's Diamond Boy. On her dam's side she is solid black. A strong boned female. Bella has bright crimpy fleece. 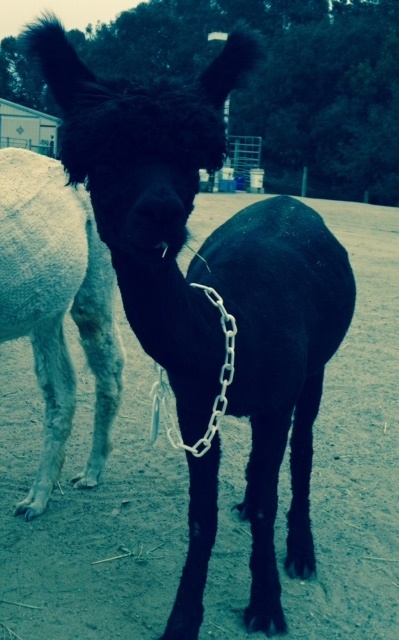 Her 2007 cria was a nice little black male. From the time he was born we knew he was a star. My husband came back from work and asked if there were any babies born. I told him we had a silver boy and he was up at the barn. When he came back down to the house his remarks were, "there is absolutely nothing wrong with this boy!" And that is the way it has been from day one. Royal as we call him is a beautiful clear blue medium silver boy with a stunning head, perfect bite, heavy bone substance and massive coverage from his head all the way to between his toes. When his lower leg fleece is wet it drags on the ground. Your hands practically melt when you grab his fleece. He has a soft silky clear blue fleece with an amazing hand and virtually no medullation. His density is 65 follicles per sq mm as tested by Norm Evans. His histogram is virtually unchanged from his yearling to his 2 yr sample and he is settling females! (17.3, 3.1, 18.0, 0.5) His pedigree is heavy on silver so if you are looking for a young up and coming male to breed your silver females to take a look at Royal. Oh, and by the way did I mention he has a great disposition?!!! He is the most complete package. Take a look at the pictures and we think you will agree. Bella Noche's two previous offspring, ROCKSTAR's Steely Dan and ROCKSTAR's Velvet Revolver are both Futurity blue ribbon winners, and Steely Dan went on this year to win a huge 1st place in the GWAS yearling male halter competition! In addition, both Steely and Velvet were on the US Steel Get of Sire team at the AOA National show, along with Granite Bay Royal Steel, winning 3rd place, and a very noteworthy placing in uber-stiff competition! Bella Noche is a very sweet, very fine and uniform daughter of LV Vantaggio Di Bisturi and BF Bella Mia. Noche, as we call her, is conformationally perfect - very compact, perfect bite with fuzzy little ears and true black fleece from her nose to her toes. She exhibits an extraordinary combination of fineness and density with fleece architecture that falls into small bundles and crimp from skin to tip. There's nothing not to love about her! 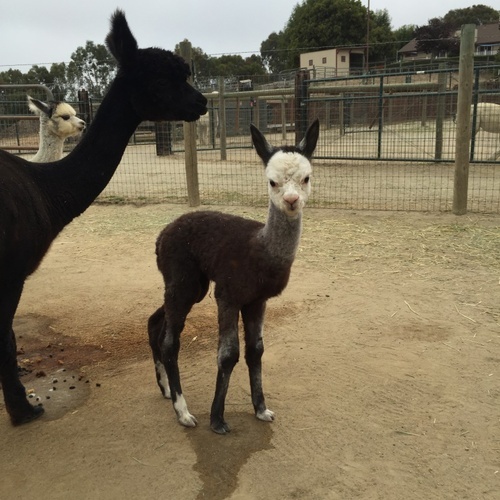 She hails from great production lines on both sides of her pedigree, and you can expect years of top quality offspring from Noche's proven genetics.